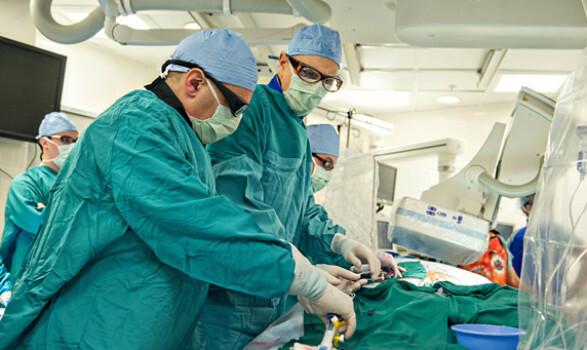 The University of Michigan Frankel Cardiovascular Center is one of the first hospitals in the country to implant Medtronic’s new investigational device during transcatheter aortic valve replacement (TAVR). The CoreValve® Evolut™ R System is being studied in patients with severe aortic stenosis who are considered at high or extreme risk for open heart surgery. The U-M is part of the CoreValve Evolut R Clinical Study which will evaluate the safety and effectiveness of the Core Valve Evolut R System. The first implant was performed last week by interventional cardiologist Stanley J. Chetcuti, M.D., and U-M cardiac surgeon George Michael Deeb, M.D., along with U-M interventional cardiologist Paul Michael Grossman, M.D. The new system was designed to allow physicians to recapture and reposition the device during the procedure, if necessary, and the device employs a smaller delivery system than first generation devices. The U-M implanted the device during a TAVR procedure for an 87-year-old Michigan woman with severe symptomatic aortic stenosis. The prospective CoreValve Evolut Clinical Study will enroll up to 250 patients with severe aortic stenosis who are considered at high or extreme risk for open-heart surgical aortic valve replacement, at up to 25 U.S. sites. Aortic stenosis is a condition where the aortic valve narrows, thereby limiting blood flow from the heart’s main gate to the rest of the body. Eventually this causes the heart to weaken and function poorly, which may lead to heart failure and increased risk for sudden cardiac death. The CoreValve Evolut R System replaces a diseased aortic valve through a minimally invasive procedure without open heart surgery and without surgical removal of the diseased aortic valve. The device is typically inserted via an artery in the leg and then guided through the arteries into the heart. Once in place, the device expands and takes over for the diseased valve to enable oxygen-rich blood to flow efficiently out of the heart.